Image caption Chaidh camarathan a chur an sàs aig 27 diofar phàirtean den rathad, far nach eil e dùbailte, air cosgais £2.5m. Chaidh camarathan ùra a bhios a' tomhas an astair choitchinn aig a bheil càr a' siubhail a chur gu dol Dimàirt air an A9 eadar Inbhir Nis agus Dùn Blathain. Chaidh camarathan a chur an sàs aig 27 diofar phàirtean den rathad, far nach eil e dùbailte, air cosgais £2.5m. Tòisichidh sgeama pìleat cuideachd Dimàirt, a leigeas le làraidhean mòra siubhal aig 50 mìle san uair, seach 40. Tha Ministear na Còmhdhail, Cè MacIlleDhuinn, a' cumail a-mach gum bi an rathad as cunnartaiche an Alba nas sàbhailte ri linn nan atharrachaidhean. Tha na camarathan ùra mar phàirt de phlana gus an A9 a dhèanamh nas sàbhailte. Thuirt oifigearan còmhdhail roimhe gun robh iad misneachail gun dèan na camarathan an rathad nas sàbhailte agus gun tig lùghdachadh dan àireamh de thubaistean. Tha cuid ann ge-tà, a tha a' cumail a-mach nach obraich iad. 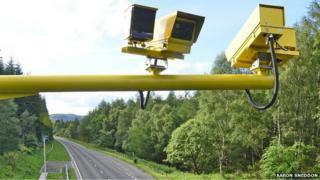 Tha a' bhuidheann A9 Average Speed Cameras Are Not the Answer air a bhith ag iarraidh air an Riaghaltas dèiligeadh ri mar a tha daoine a' dol seachad air carbadan aig droch amannan. Tha cuid eile a' cumail a-mach gum bu chòir an casg-astair air pìosan den rathad a chur suas, 's iad a' cumail a-mach gur e cho slaodach 's a tha cuid de charbadan a' dol air an rathad a tha ag adhbhrachadh cuid de na tubaistean. Tha Riaghaltas na h-Alba a' cumail a-mach ge-tà, gun toir na camarathan piseach air sàbhailteachd do dhràibhearan san fharsaingeachd - co-dhiù gus an teid an A9 air fad a dhùblachadh. Gheall an Riaghaltas gum biodh an A9 dà-fhillte eadar Peairt agus Inbhir Nis ann an 2025.